The Essex ARG was formed in the mid 1990's. A relaunch occurred at Abbotts Hall Farm in 2002 where the group was re established organising training events on great crested newts and reptiles. Since that time the group has varied in size year on year. Anyone who works, lives in Essex can become a member of the group. Recording efforts are shared with the Essex Field Club where events are put on jointly. The group is rather informal at present with various low key projects being implemented surrounding pond restoration, creation and habitat management. Involvement with local Biodiversity Action Plans used to be an important role for the group in terms of reptiles and amphibians but unfortuantely there are now moves towards habitat action plans and less focus on species. The Essex ARG has now embarked on helping with managing nature conservation sites in the county. Three such sites are planned in Basildon, Rochford & Colchester the focus of the group is changing towards a proactive stance rather than a reactive approach towards development - areas of land will be maintained to benefit wildlife particularly its herpetofauna. Again the 'Friends of the Wick Country Park' triumph in the rain! Nothing could dampen our spirits yesterday. You just had to see how much the families enjoyed studying the quiz, bug hunting, pond dipping, gluing, holding a slow worm, having a go on the lucky dips, visiting the charity stalls etc etc to know all the preparation before and the hard work on the day was all worth while. We had about 150 people visit the park. A number that I am sure would have been higher if the weather had been kinder. But those who did come were very impressed with the opportunities we provided to get close to nature. The children delighted in taking home their certificates, 'I'm a first class pond dipper' book mark and their own pompom bug. Some went home with large cuddly toys or books and some parents bought the best made bird boxes I have ever seen! A burger and chips for the hungry and free tea and unlimited biscuits for all provided the finishing touches to a wonderful day. Congratulations and thank you to everyone who was involved. We also made £90 which will go towards additional benches in the park and four new members joined the Friends of the Wick Country Park. The Essex ARG had a brilliant day at the country park promoting the work of the ARG, and the Amphibian & Reptile Conservation Trust. A display of information from the ARC trust, BHS, Pond Conservation and ARG UK was given out to the vistors. Live animals were exhibited at the event so that the public could get hands on with live native herpetofauna from the area. Records of European Water Frogs were reported by South Essex Natural History Society member from Noak Bridge. The idenification of these frogs are coming a step closer as they do not sound like the Water frogs found at Hadleigh Country Park. It seems that these frogs are Southern Clade Pool Frogs. Over the weekend the Essex Amphibian & Reptile Group displayed live animals to members of the public who had ventured out into the wild on Wallasea Island. The main stars of the EARG stall were the great crested newts, common toad, slowworms and the non native yellow bellied toads which were presented to members of the public who wanted to find out more about amphibians and reptiles found in the county and particularly the reptiles which are resident on Wallasea Island. Many interesting stories were given by the public about their experiences with herpetofauna in their gardens and on trips out around the Essex coast. The Essex ARG were really pleased with the turn out and the steady stream of people taking away information on the various campaigns which are headed up by the Amphibian & Reptile Conservation Trust the national NGO which is the leader in herpetofauna conservation in the UK, Europe and in the overseas territories. Publications included advice about dogs and adders, and the sliding scales project. the Dragons in your garden leaflet was also very popular along with Pond Conservations excellent guide to creating wildlife ponds for gardens. The EARG will be setting up a reptile monitoring project in conjunction with the RSPB this autumn focussing on the adder but also the other resident species the viviparous lizard. Volunteers can help with the survey if they contact the EARG using the contact page we can then give further details of when and how the surveys will be undertaken this autumn. The Essex ARG will be attending a number of public events this July and August. Joining the RSPB at their project 'Wild Day Out' on Wallasea Island on the 30th July and also at the family day at the Wick Country Park, Basildon. Our stall will be encouraging people to help local herpetofauna and to illustrate the species which are found on each of the sites. The first arrival of baby lizards were reported from a large key reptile site in Basildon. The Old Nevendon Road Nature Reserve had baby lizards reported by Ray Cranfield on the 15th July 2011. Following on from the early breeding of great crested newts in February the new ponds on the site have very good numbers of adult and baby great crested newts. Over 25 adult newts were spotted within the six ponds on the site. This is a pretty good number of newts and it is more so as theses animals were seen in broad daylight! Watch out for an organised event at the Private Nature Reserve in August & September - details to be announced soon. 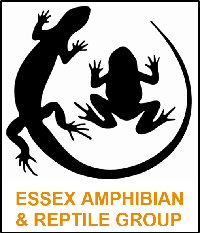 Surveys for amphibians have taken place across Essex in recent weeks, with ponds in Brentwood, Warley, Thorndon CP and Wat Tyler CP surveyed. There have been encourging finds, with one pond in Brentwood holding all 3 native UK species of newt (see the photo in the gallery here) and the survey of Wat Tyler CP yelding 90 great crested newts! We didn't even have time to look in all the ponds too! There is a photo of a nice male great crested newt in the gallery here. If you would like to get involved in the surveys please do get in touch using one of the methods on our Contact Us page.